Lennie James in Fear the Walking Dead. Photo by Richard Foreman, Jr/AMC - © 2018 AMC Film Holdings LLC. All Rights Reserved. As Season 4 begins, Morgan’s still down in the dumps, but he just wants to be alone. Jesus, Carol and Rick try to talk bring Morgan back into the world, unsuccessfully. He’s a loner. And when he starts walking away from civilization, he’s got no destination in mind. 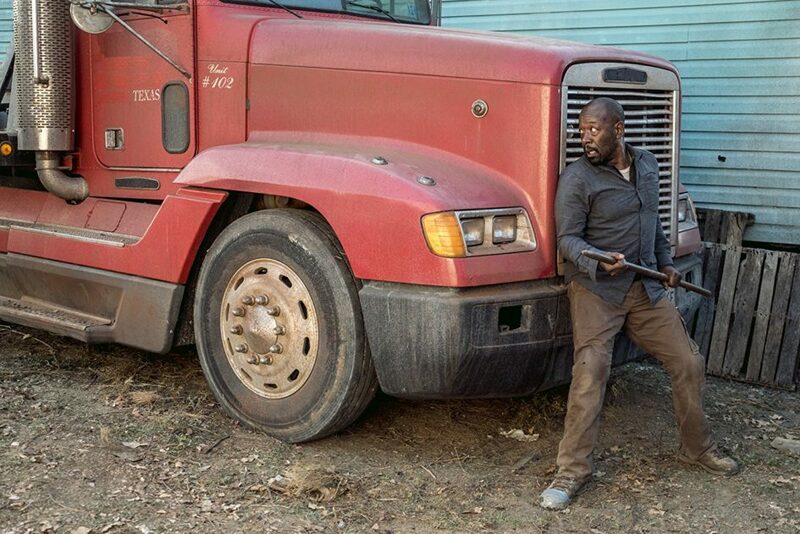 Traveling from Virginia all the way to Texas, Morgan definitely puts the “walking” in The Walking Dead, but it doesn’t take long for Morgan to get into some trouble that he wasn’t looking for. And then he starts running. In “What’s Your Story,” some new characters are introduced, including John Dorie (Garret Hildebrand), who seems to be a gunslinger and Althea (Maggie Grace), a journalist who drives a SWAT truck, saving people in order to get their stories. This small group of survivors get mixed up with a small group of human antagonists, until their fate is sealed. And somehow, a grenade works its way into the storyline… again. The dead get a new nickname (“passed”) and by the episode’s conclusion, Nick, Alicia, Strand and Luciana finally appear… this time, they’re the bad guys. This makes so much more sense than the previous main characters being good guys! Featuring a new intro, this already feels like a better TV show than the one from the past three years. It’s clear that you can survive on your own in this world, but you’ll always run into trouble, whether you’re looking for it or not. That’s why you should always roll with a crew. Morgan was the central focus of the first episode, but I’m definitely interested if the series will continue along with his journey, or will eventually branch off back to focusing only on the Clarks. Here’s to hoping that doesn’t happen. Morgan is complicated, but so far we haven’t seen the demons that haunt him on this show… so far. Most importantly, where’s Old Man Salazar? Surely he somehow survived the explosive events from last year. Maybe he’ll show up on a sweeps month episode? Or maybe he was written off. Here’s to pulling for the former. The biggest surprise of this episode: I was totally impressed with the performance of Maggie Grace. Clearly, I haven’t kept up with her past performances throughout the years. The last time the actress popped up on my radar was on Lost as the annoying Shannon Rutherford. Here, she’s a catalyst for creating a group of survivors and Althea’s character is easy to root for. From the looks of the next episode (“Another Day in the Diamond”), Madison’s back, but what exactly is the timeframe for this series? Previously, it was believed to be taking place before the events of the current-day TWD, but now, both shows seem to be running simultaneously. I’m guessing there will be plenty of flashbacks to bring the viewers up to speed. Speaking of viewers, 4.1 million people watched the episode, which is a 32 percent leap over last year’s premiere and it’s the best ratings since the Season 2 premiere… but will the audience return as the show’s focus returns to the Clarks? Here’s to hoping the new faces of the cast and a renewed energy from the filmmakers will make this the best season so far.